Follow the links and read below the Rave Reviews and listen to a wonderful preview! Stephen Sondheim, considered by many as the ultimate composer of American musical theater, first gained notice when he wrote the lyrics for Bernstein’s score for “West Side Story.” Sondheim has a very unique musical style and is an exceptionally clever lyricist as well. One doesn’t want to miss a word, so vocalists have to articulate very carefully when delivering his compositions. 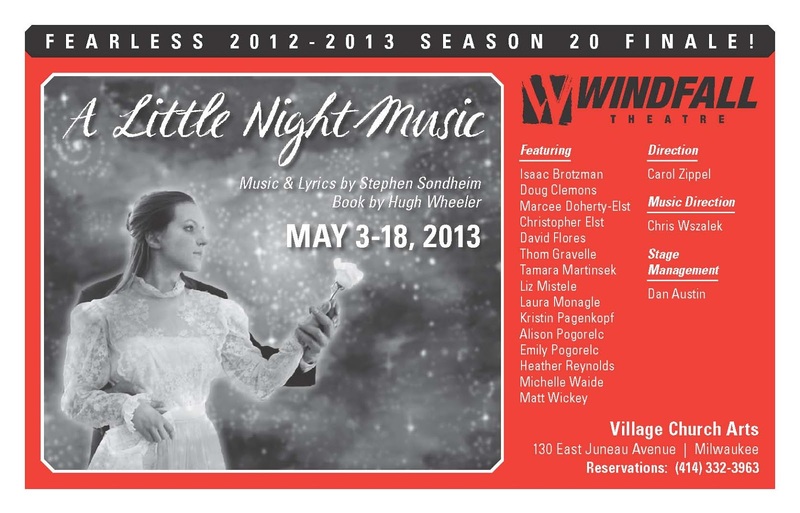 Windfall Theatre celebrates its 20th anniversary with a stunning production of “A Little Night Music.” One can hardly believe the assemblage of talent that Carol Zippel gathered for this show. 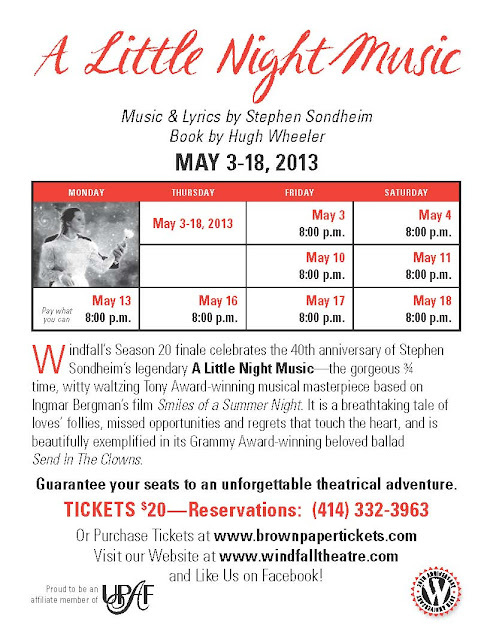 Sondheim himself would probably revel in this showing of his musical on its 40th anniversary. Set in Sweden in the early 1900’s, it is based on an Ingmar Bergman film, “Smiles of a Summer Night.” There definitely are smiles in this show. It swirls along with graceful dancing, sexual intrigue, amid the witty wisdom of Madame Armfeldt, the elder of the tribe, so deliciously portrayed by Michelle Waide. The opening overture introduces us to five strong vocalists – Matt Wickey, Kristin Pagenkopf, Marcee Doherty-Elst, Isaac Brotzman, and Heather Reynolds – who set the tone of the whole production. We already sense, under the musical direction of Christopher Wszalek, that we are in for a melodic banquet. This quintet of voices appears regularly to provide transitions and emphasize main turning points in the story. The plot revolves around Fredrik Egerman, masterfully rendered by the incomparable David Flores, his second wife, the still innocent Anne, nicely depicted by the lovely vocalist Emily Pogorelc, his former lover and actor Desiree, a complex mix of flamboyance and confusion, cleverly captured by Tamara Martinsek, and another unforgettable couple, the blustering Count Malcolm (Christopher Elst) and his acerbic wife Charlotte (Laura Monagle), both of whom cross paths with Fredrik via Desiree. Two other characters provide supreme delight – Doug Clemons as Henrik, Fredrick’s tortured son, and the flirty, dirty maid Petra, hilariously rendered by the inimitable Liz Mistele. 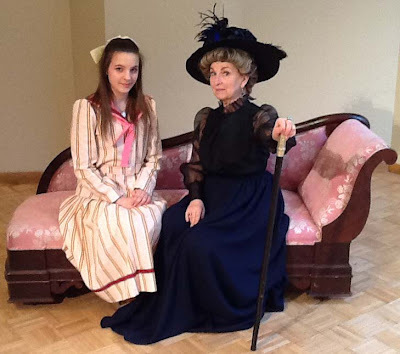 Alison Pogorelc does a good job as Desiree’s daughter and companion to her grandmother, Madame Armfeldt. Few of Sondheim’s songs enjoy a life beyond his musicals, with the exception of “Send in the Clowns,” which provides the moving climax of this show when Fredrik and Desiree realize that they may finally get their timing right. There are many numbers, however, that are vital to the context of the story and are beautifully delivered by these gifted vocalists. Several of these include, “Later” by Henrik; “Soon” by Fredrick, Anne and Henrik; “In Praise of Women” by Carl-Magnus Malcolm and “Every Day a Little Death” by Anne and Charlotte. 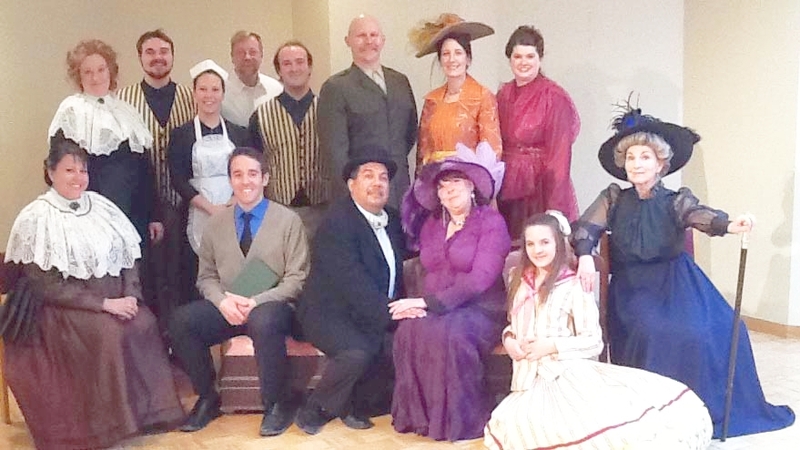 The ensemble number “A Weekend in the Country”is especially well done, emphasizing in its lyrics Sondheim’s supreme sense of irony. Mention must also be made of Petra’s strong rendering of “The Miller’s Son.” Mistele has such a mischievous quality about her that one has to smile just anticipating her next move. I can’t rave enough about this powerful show. It already has made my list of “The Best of 2013” and it’s only May. I can’t imagine another show that will match this one. Because Windfall Theatre has its home in the Village Church at 130 E. Juneau in Milwaukee, there are no performances on Sunday. The remaining dates include May 10, 11, 16, 17, and 18. Call 414-332-3963 or visit www.WindfallTheatre.com before all the seats are taken. This is a small theater and a great production directed by the multi-talented Carol Zippel.